To Whom do we Pray. A sermon preached at The Kirk of Kansas City, Missouri, on September 30, 2018. So a few months ago, I was on a plane returning from a meeting in Louisville. and I just vegged out a bit. even closed my eyes for a bit. It was glorious. that marks the final moments of landing on a plane. as it makes its way safely back to earth. I don’t know how many airplane trips I’ve taken. They number in the hundreds, most likely. that enabled tons of metal and glass to soar. I didn’t want to be a policeman, or a firefighter. I wanted to be a pilot. but I noticed something about myself, when I heard that sound and felt that jolt. Our father. Who art in heaven. And the glory. Forever and ever. Amen. every takeoff and landing, for decades. Sometimes I don’t know that I’m doing it. and I give myself a moment to center myself. of the God who loves me. when I was bedside at Rush University Medical Center in Chicago. to which I had been assigned. from well before I started my three month program. and, when I was visiting her, she was barely responsive. Her eyes were open when she was not sleeping. She could eat, even if with some labor. no sense that she heard or registered much of anything going on. was there to be with them during this time. a member for more than 30 years at a church on the west side of Chicago. I told her that the Presbyterians got along nicely with the Methodists. or the orderly who came to straighten up the room. to her, sure, but with her, I was hoping. Even as she was looking into a blank space on the wall ahead. and move on to another patient. I read her something, I don’t even remember what it was, really. It was right about then that I noticed I wasn’t praying alone. And she smiled. And a moment later, it was over. at least for a few weeks, before she left for another rehabilitation hospital. No other words, or eye contact, or much of anything. that she could access, when all other words were gone. That God was THERE, surrounding us with God’s love. Some call this prayer the greatest prayer, or the prayer of prayers. shared by Christians the world over. but it never mentions Christ. but it never mentions church. but it never mentions Lord. but it never mentions the inspired inerrancy of the bible [or] the virgin birth…. but it never mentions the evangelium, the gospel. but it never mentions the Holy Spirit. never once mentioning congregations, elders, priests, bishops or popes. this prayer isn’t one of them. It would be wrong to suggest that we all treat it the same way, because we do not. and all across the ideological and theological divide. on airplanes or in hospital rooms around the world. This prayer, as Crossan puts it, is a revolutionary manifesto and hymn of hope. It calls for God’s justice. It inspires us to trust. It is the foundation for all of our prayers to God. One in Luke and one in Matthew. that they’re not the same. and its in a different part of Jesus’s life story. each with their own take. Perspectives differ. that he had an idea. And he set about “fixing” Luke by adding the verses that Luke “left out”. where that copy was then copied by a later scribe, and so on. and this sort of thing happened from time to time all over the place. and you’re relying on Friar Tuck to do that work for you. the one that played a pivotal role in the worship and devotional life of Christians. so Luke had to be cleaned up a bit to make it just so. Apparently, the faithful were encouraged to say the Lord’s Prayer three times a day. of helping us welcome in the peaceable Kingdom of God. reminds us of the importance of our words, and how we lift them up to God. not to pray in a vain way, to be seen, or for show. Empty people, Jesus says, love to stand and pray so that they may be seen by others. The point for them isn’t the prayer. Its not what is said. Its not the divine to whom the prayer is offered. Jesus is trying to counter. 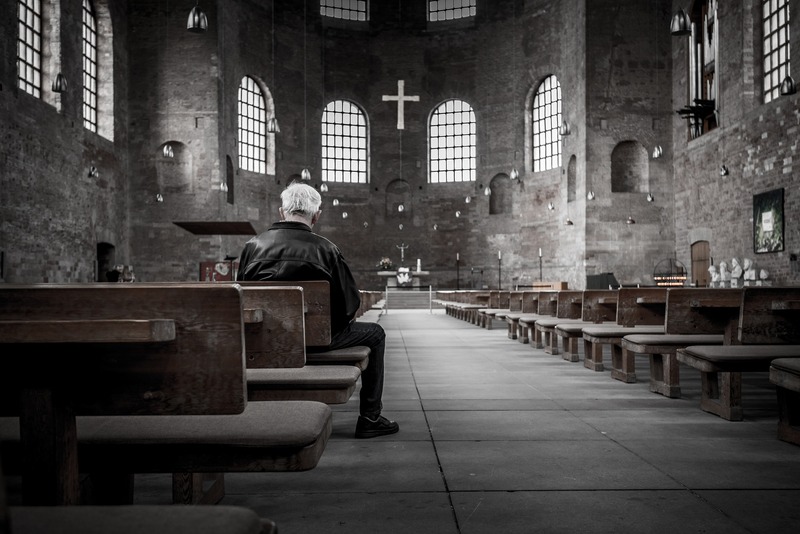 There’s nothing empty and self-serving about authentic prayer. between pray-er and the one to whom we pray. It’s not about being seen as godly in the sight of others. It’s about being in the presence and the love of God. a form of address to the one we pray to. words of praise to give respect and honor and reverence. and with all your soul and with all your might. Our Muslim neighbors proclaim God is great. There are a few things we need to mention here. The God who dwells intimately within him. The Aramaic word kids used for their daddy. high and inaccessible to us mortals. Not JUST our God who art in heaven. But also God as close to you as your daddy. Closer to you than your own breathing. Jesus liked to use this language for God, a lot. God is close. God cares for you. God loves you. Its one reason you don’t have to fear. Now, this language isn’t always comforting for us, truth be told. Some of us may have had awful daddies. Mean, brutish, violent. Ugh. So awful. saying that it must always be so. But Jesus isn’t doing that. –or the person who throws a wild party for those on the street. one God, mother of us all. The one who is who God is. one that is good and kind and true. who leaves us standing on holy ground in her presence. Go, set my people free. and utter these words week in and week out. is the purpose of our prayers. It’s not about being seen by others. It’s not about confirming our own provincial perspective. the one in whom we live and move and have our being. more closely over the next several weeks. with love and care and compassion. [i] The Greatest Prayer: Rediscovering the Revolutionary Message of The Lord’s Prayer (New York, New York: Harper One, 2010). His prologue is entitled “The Strangest Prayer”. [ii] Most interesting to me is the Didache, an ancient guide book for the early Christian community. It contains the version of the prayer we say to this day, a combination of Luke and Matthew’s version, along with the concluding benediction. The Penguin Classics translation of The Didache, by Maxwell Staniforth, reads “Your prayers, too, should be different from theirs. Pray as the Lord enjoined in His Gospel, thus: ‘Our Father, who art in heaven, Hallowed be thy Name, Thy kingdom come, Thy will be done, As in heaven, so on earth; Give us this day our daily bread, And forgive us our debt as we forgive debtors, And lead us not into temptation, But deliver us from the Evil One, For thine is the power and the glory for ever and ever. Say this prayer three times every day. '” Found in Early Christian Writings: The Apostolic Fathers. (New York: Penguin Books. Reprinted edition, 1987). p184.